It was released sometime around 2012. 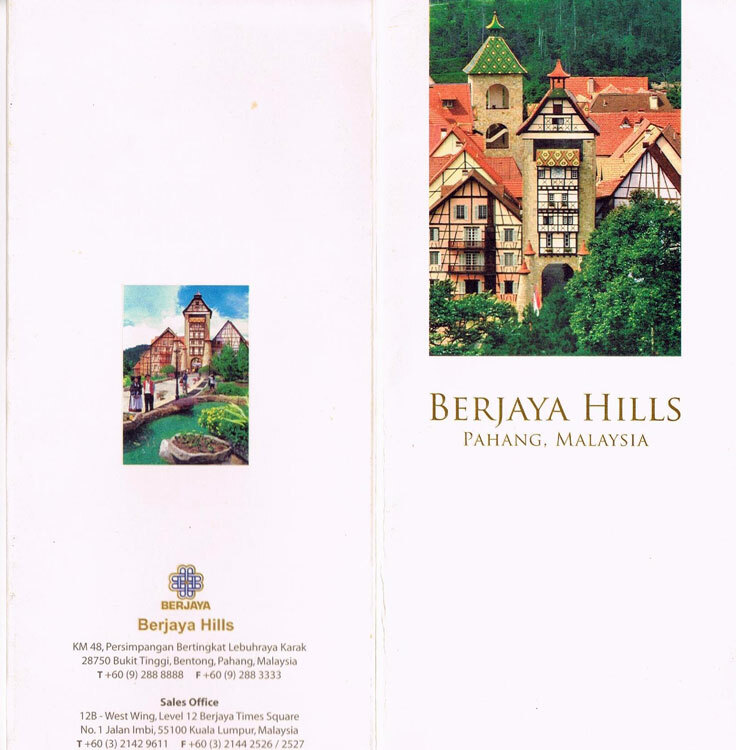 Step into the heart ofenchantment....step into Berjaya Hills, a veritable fairy-tale land of different world cultures just 45 minutes drive from Kuala Lumpur and 10km off the East-West Karak Highway. Spanning over 16,000 acres of rugged hills and mountains, 3,000 feet above sea-level and amidst 150 million-year-old rainforests, Berjaya Hills is the perfect setting for inspiration and renewal. 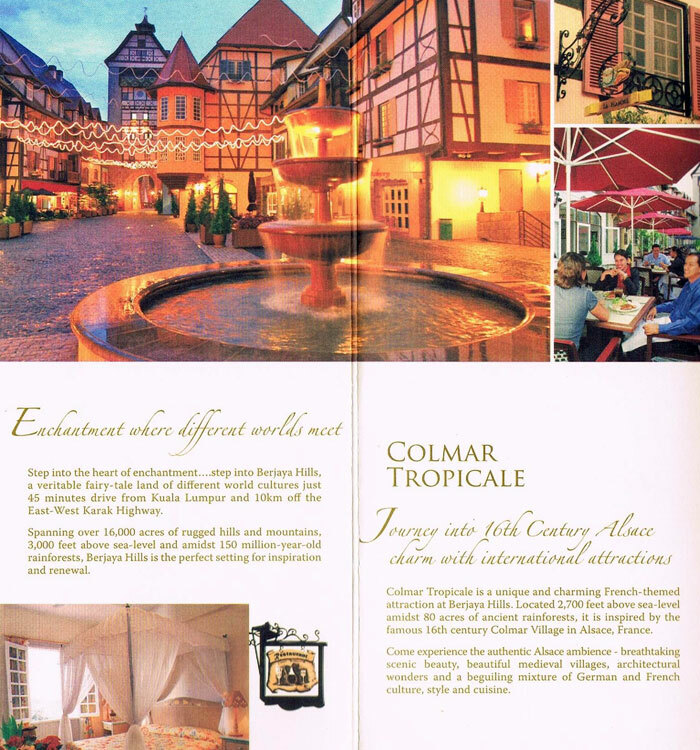 Colmar Tropicale is a unique and charming French-themed attraction at Berjaya Hills. Located 2,700 feet above sea-level amidst 80 acres of ancient rainforests, it is inspired by the famous l6th century Colmar Village in Alsace, France. 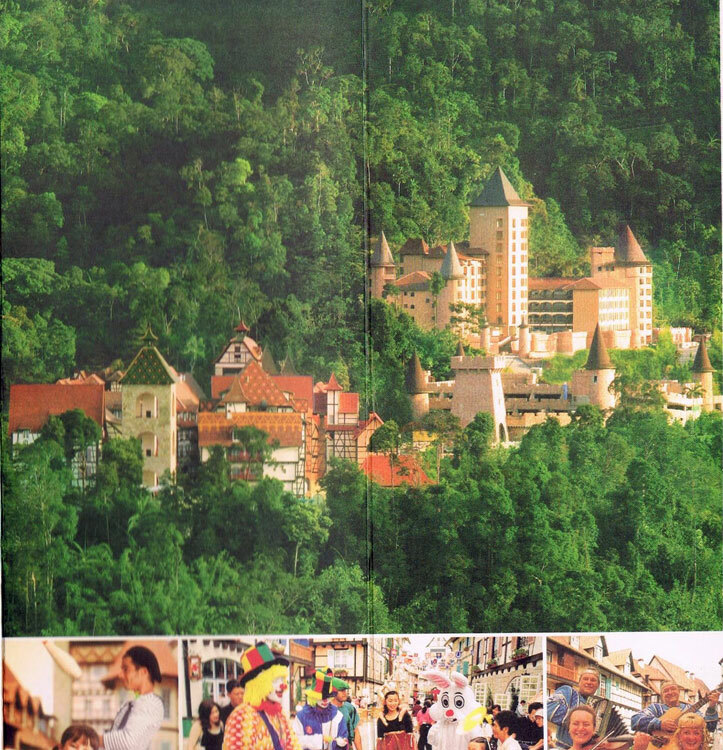 Come experience the authentic Alsace ambience - breathtaking scenic beauty, beautiful medieval villages, architectural wonders and a beguiling mixture of German and French culture, style and cuisine. and contemporary trends in fitness, nutrition and spa therapies. 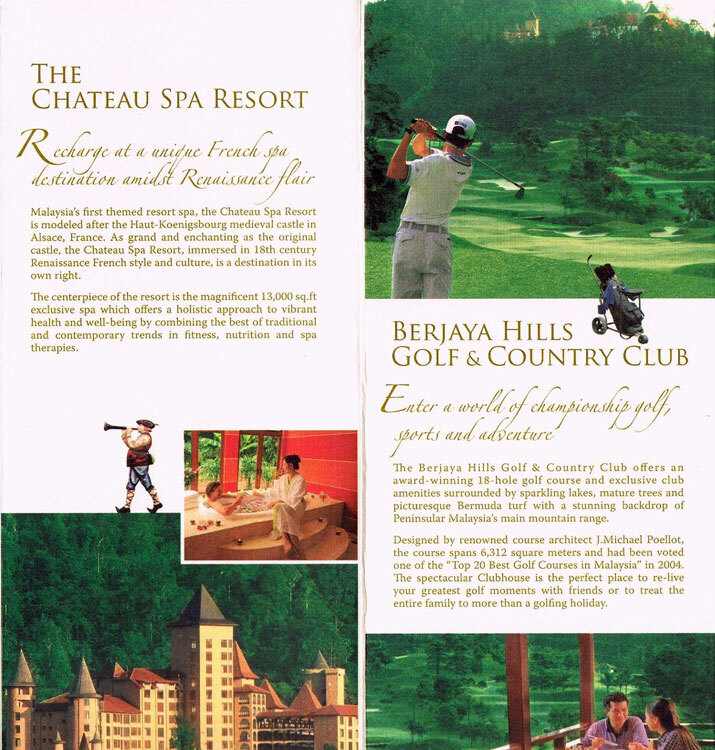 The Berjaya Hills Golf & Country Club offers an award-winning 18-hole golf course and exclusive club amenities surrounded by sparkling lakes, mature trees and picturesque Bermuda turf with a stunning backdrop of Peninsular Malaysia‘s main mountain range. Designed by renowned course architect J.Michael Poellot, the course spans 6,312 square meters and had been voted one of the “Top 20 Best Golf Courses in Malaysia“ in 2004. The spectacular Clubhouse is the perfect place to re-live your greatest golf moments with friends or to treat the entire family to more than a golfing holiday. art of bathing outdoors at the Tatami Spa to experience total bliss and relaxation. Complementing the Japanese Village, the spa embodies the essence of furo (spa bathing) to restore the spirit as well as the body. Just minutes away from Berjaya Hills attractions and recreational facilities are the Meranti Park Suites, an exclusive “home away from home“ retreat. With its golf course and mist-shrouded mountain views, the Meranti Park Suites exude a luxurious country atmosphere. The spacious apartments offer the best in quality, style and comfort and are ideal for those who seek a sanctuary of tranquility, security and total privacy. 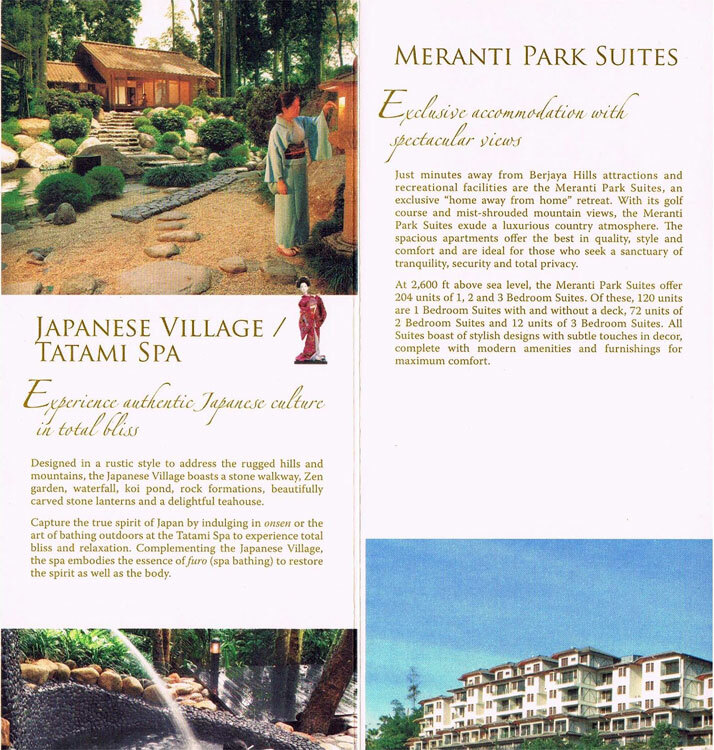 At 2,600 ft above sea level, the Meranti Park Suites offer 204 units of 1, 2 and 3 Bedroom Suites. Of these, 120 units are 1 Bedroom Suites with and without a deck, 72 units of 2 Bedroom Suites and 12 units of 3 Bedroom Suites. All Suites boast of stylish designs with subtle touches in decor, complete with modern amenities and furnishings for maximum comfort. Berjaya Hills is a great place to motivate educate and celebrate. 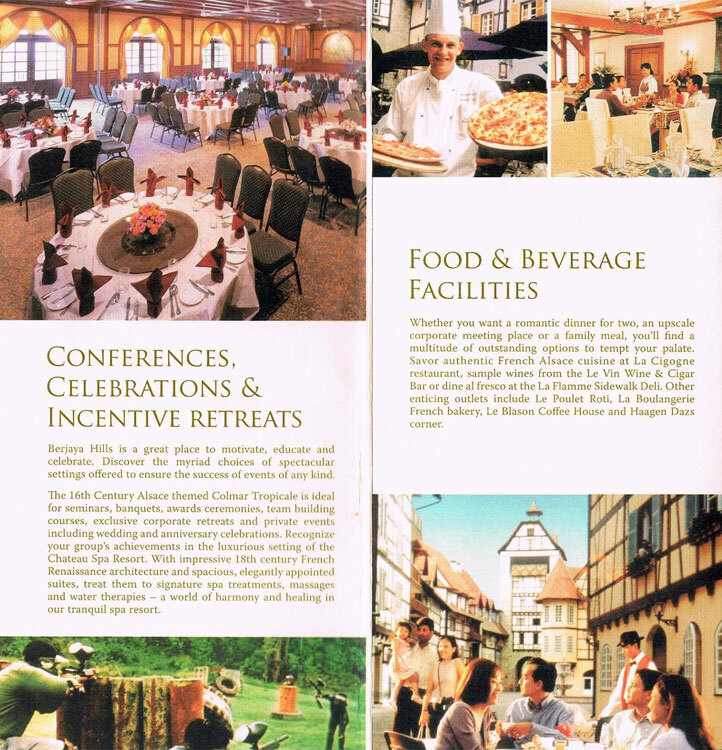 Discover the myriad choices of spectacular settings offered to ensure the success of events of any kind, The l6th Century Alsace themed Colmar Tropicale is ideal for seminars, banquets, awards ceremonies, team building courses, exclusive corporate retreats and private events including wedding and anniversary celebrations. Recognize your group‘s achievements in the luxurious setting of the Chateau Spa Resort. With impressive 18th century French Renaissance architecture and spacious, elegantly appointed suites, treat them to signature spa treatments, massages and water therapies — a world of harmony and healing our tranquil spa resort. Whether you want a romantic dinner for two, an upscale corporate meeting place or a family meal, you'll find a multitude of outstanding options to tempt your palate. Savor authentic French Alsace cuisine at La Cigogne restaurant, sample wines from the Le Vin Wine & Cigar Bar or dine al fresco at the La Flamme Sidewalk Deli. Other enticing outlets include Le Poulet Roti, La Boulangerie French bakery, Le Blason Coffee House and Haagen Dazs corner. 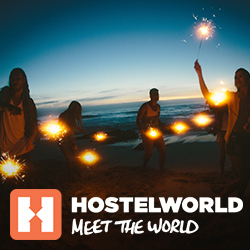 Looking for family friendly activities and adventures? 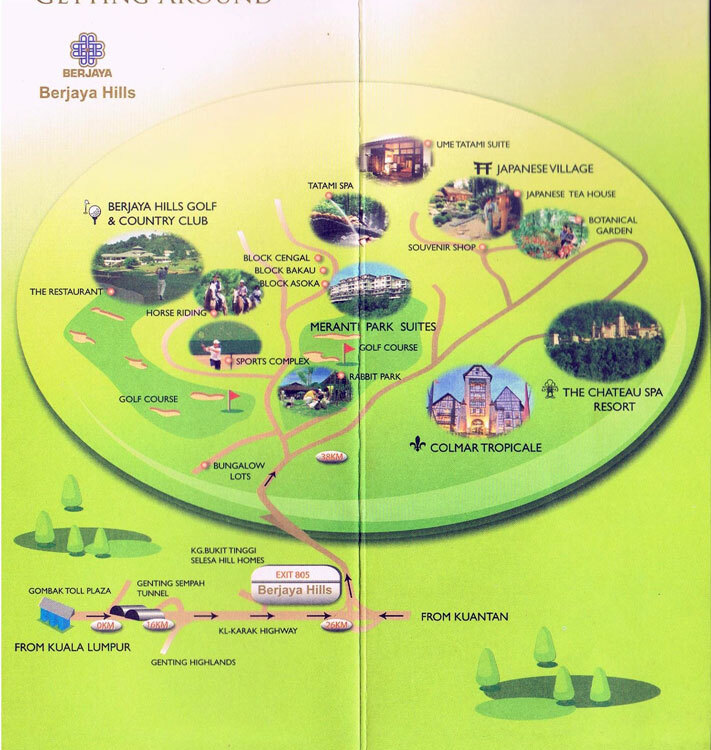 Berjaya Hills has something for everyone. A children‘s farm comprising Rabbit Park, deer sanctuary and donkey rides where animals roam freely will get the children all excited. To experience the splendor of the rugged hills, valleys and rainforests at Brjaya Hills, we offer a variety of Horse Trails and horse riding adventurres. 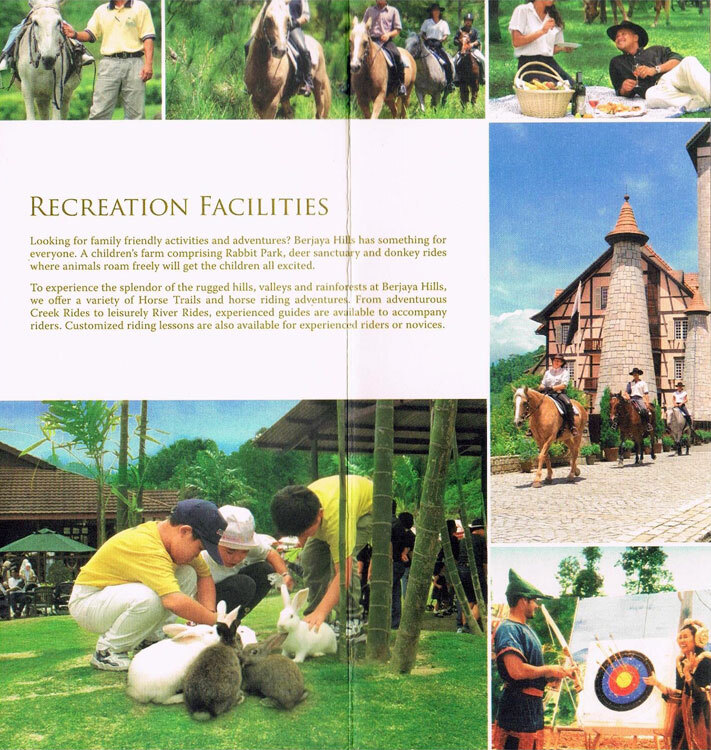 From adventurous Creek Rides to leisurely River Rides, experienced guides are available to accompany riders. Customized riding lessons are also available for experienced riders or novices.